Mobile operators, it would appear, remain captivated by connectivity solutions. Most recently, low-power technologies (e.g. LoRA, NB-IoT, SigFox etc.) have dominated the industry agenda. This outlook is slowly starting to change. Ian Huh, SVP of SK Telecom’s (SKT) IoT business described fees on its LoRA network as amounting to just 10 per cent of those on 3G/4G networks . He pointed out that this would need at least a tenfold increase in the number of connected devices in highlighting the potentially destructive impact on revenues. SKT’s comments are timely and show that the debate is shifting from shiny new technology to earning commercial returns. MNOs need to do something, over and above the sale of SIMs and connectivity, to capitalize on the wider IoT business opportunity. AT&T, for example, plans to white label its smart city offering to other CSPs around the world . Vodafone’s CEO wants to add a consumer offering to its traditionally strong stable of enterprise IoT offerings . These may be a start but they have the look and feel of exploratory ideas, touching on the margins of the IoT market opportunity. If MNOs are serious about the IoT market, they need a longer-term view and a strategic road map that will lead them to future generations of IoT services. It’s not enough to make incremental additions to existing services and technologies. MNOs need to think about shifts in technology (to capabilities higher up the value stack) as well as the organizational competencies they will need to master in order to innovate effectively and serve customers on commercially viable terms. Let’s look at the transport sector to illustrate a few of the opportunities and challenges. In the illustration below, an MNO might start out offering vehicle telematics services to fleet operators (B2B) and to consumers (B2B2C and B2C variants), for example. These are illustrative of silo solutions, where the value chain takes the form of a linear stack. For the most part, the Enterprise business unit of an MNO would provide such offerings, although there is scope for Consumer business units to get involved in the case of a B2C arrangement. Building on telematics technology and the associated customer support knowhow might lead to a usage-based offering for insurance-sector customers. It might also become a path to opportunities in the intelligent transport arena, beginning with ideas such as freight convoys. There comes a point where intelligent transport offerings start to intersect with smart city solutions. 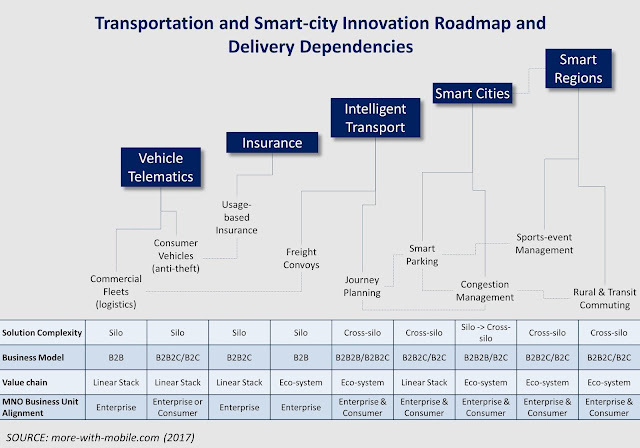 Journey planning becomes more valuable by linking smart parking and congestion management services, for example. Soon, intelligent transport and smart city ideas morph into smart region services as in the case of managing spectators for a major sporting event or services targeted at rural and transit commuters. Towards the right had side of the illustration, MNOs face a more complex set of requirements and solutions. Silo applications evolve into cross-silo solutions. Business models involve longer chains and become more complex. The case of AT&T’s smart city solution might take the form of a licensing and technology transfer deal. However, if AT&T gets involved in service delivery for citizen services then the value stack suddenly expands to a B2B2B2C type of arrangement with all the attendant challenges associated with customer support and risk/revenue sharing. That’s not the only complication. The conventional stacked value chain turns into eco-systems because more parties are cooperating in delivering a service. MNOs may need to ensure proper alignment between their Consumer and Enterprise business units in relation to different customer segments and different expectations for service quality. Behind the scenes, this requires procedures for account management and coordination, for customer-data sharing, for revenue reconciliation and for cost allocation. Take the case of Vodafone’s ambition to offer consumer IoT solutions. The Vodafone Consumer business unit’s choice of markets and services may raise conflicts if the target consumers (for Vodafone’s B2C offering) also happen to be customers of independent businesses served by Vodafone’s Enterprise business unit. Such tensions are not necessarily bad news. Many of the new business challenges will drive innovation and organizational change. They will prompt MNOs to pursue new opportunities in areas such as data monetization, white-labeled analytics and orchestration of complementary services from third-party partners. However, in the absence of an adequate strategic roadmap and an adaptable operational model, there is a risk that MNOs will find themselves carrying the costs of low-power networks with only a small fraction of the total benefits. Some timely observations on the imperative for change amongst MNOs and their IoT business units from Vodafone’s director of Internet-of-Things (IoT), Ivo Rook. There's clearly a philosophical tension between doing something new (i.e. above and beyond the network) as opposed to continuing with network-centric strategies.